Civil litigation is an important part of our legal system, allowing individuals and companies the right to seek recompense when they believe they have been wronged. No matter how similar the circumstance may seem, we know that every case is different because every set of circumstances and every relationship is different. We can help you no matter which side of the law you fall on. For A Plaintiff: If you have been wronged, it’s important that you find the right attorney to help you through your civil litigation need. We’ll work with you to get the facts straight and help you decide how aggressively to pursue your case, or whether it is wise to pursue it at all. Are you seeking money or simply want them to stop what they’re doing? There may be a civil remedy available in the law. For A Defendant: Defending yourself or your company against a law suit can create an enormous amount of stress. We have the experience to assist you through the process and defend your case aggressively. 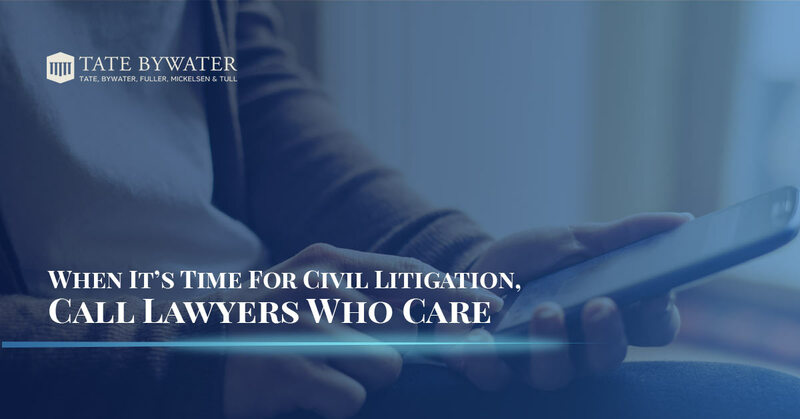 No matter what your civil need is it’s important to have a civil litigation attorney who knows when it’s time to raise the stakes and when to bring calm to the room. Give TATE BYWATER a call today.